Who Inspires You? - Abundant Living, Inc.
For the International Women’s Day celebrations this past year I was invited to speak at an inspirational event hosted by the NS Works Centre in Elmsdale, NS. Due to a prior teaching commitment, I had to decline. Later, I loved seeing the photos that were posted on social media showing women from all walks of life, many whom I knew, walking their talk at this event. 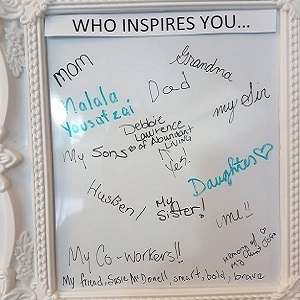 One image was of a large framed board placed in the room inviting women to share who inspired them – and low and behold my name was there in the middle. I was deeply moved when I saw this and it made me pause to think about the women who have inspired me. It’s a long list and starts with the women I have had the privilege of coaching and teaching over the years who have demonstrated courage and chutzpah by making choices that let their hearts sing. These are the soldiers who chose courage over comfort, who believed often before anyone else did, and who chose to take charge of designing the lives they desired. There have also been many teachers over the years whose words, ideas, and actions have inspired me to make bold choices along my own journey. One of these is the beloved Maya Angelou whose birthday is on the day I am writing this blog. While she is no longer with us, her wisdom continues to have an impact and consistently shows up in my own teachings. As someone who speaks often of the importance of being willing to be courageous, I was particularly struck by one of her quotes that were shared on a social media post today – “Without courage, we cannot practice any other virtue with consistency. We can’t be kind, true, merciful, generous, or honest.” So true and so inspiring.